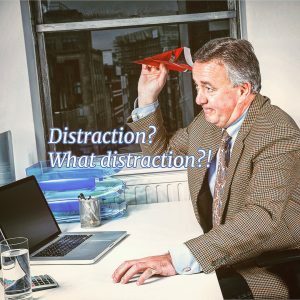 How To Avoid Distraction and Stay Focused on Your Work? For writing, planning, researching, accounting and finance and learning you need to stay focused for 2 hours. Think it’s easy? Need to stay focused, completely distraction-free, for a couple of hours? The tip is simple: When you are going to concentrate on your work or studies, do not leave all the distractions open in front of you or beside you. They will steal your attention and time. Close everything, put the phone on mute mode and get in focus. Seems easy to do? Let’s put it to test. Mail – The whole idea of e-mail communication is to bypass real-time conversation. Close all email clients – Outlook, Gmail etc. – and turn-off notifications. Social media channels – Social media is one big distraction synonym. We all know how powerful the temptation is, so the recommendation is to log-out from Facebook, Twitter, Instagram, Linkedin, and any other social channel. Phone – There is a ‘quiet’ button for a reason. If there are some phone numbers that you must leave open at all circumstances – like family – there is a way to distinguish them. Speaking of it, it would be good to establish emergency conventions with the concerned parties. Instant messaging – If your phone is on quiet mode, all you have to do is put it where you have no eye contact with the phone screen, like behind you. Turn off the desktop and web notifications. Notifications – In a world where people are always connected and have IM apps, all notification must be set to off anyway at all times. A very important assignment could be the right opportunity to establish that once and for all. News, YouTube and stuff – Yes, all the things you like must be shut down. How determined should you be with this checklist? It depends on the importance and the hardness of the assignment you are tackling. How much it is necessary for you to stay focused. The required tools for the specific task you are on. Note-taking tools – Digital and physical, so you can record online the wondering thoughts and return to focus instantly. A toy – Something to squeeze while thinking. Do not fear being disconnected for 2 hours. All the notifications, e-mails, messages, posts and tweets will be there, quietly waiting for you.